The winners of the 9th annual Rye YMCA Heads Up! 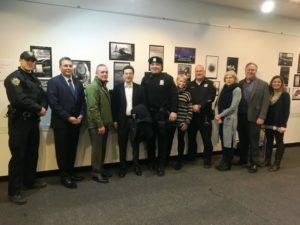 Poster Contest were saluted by community leaders at a reception at The Rye Arts Center January 22. Dozens of Rye High School Digital Photography students created posters illustrating the dangers of distracted driving and walking. 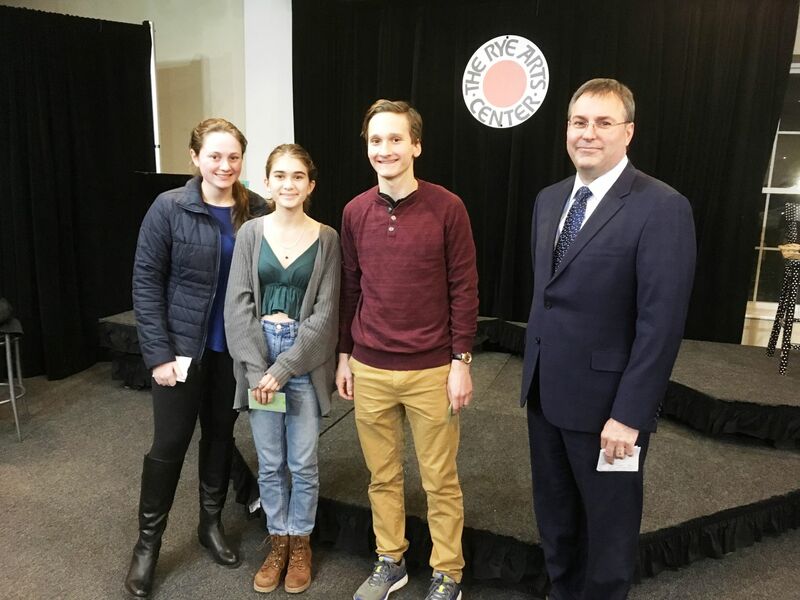 The top three — Emily Saurack, Abby Bozek, and Greg Franzetti, pictured left to right, received gift cards from Dr. Eric Byrne, Superintendent of Rye City Schools. Among the distinguished guests were: Police Officer Alex Whalen, Superintendent Dr. Eric Byrne, Lt. Robert Falk, Mayor Josh Cohn, Officer Gabe Caputo, City Councilmember Danielle Tagger-Epstein, Officer Mauricio Gomez, Meg Rodriguez, Rye Arts Center Executive Director, Brian Dempsey, Chairman, Traffic and Pedestrian Safety Committee, and Nichole Chiffriller, Rye High School Art teacher. A shout-out to Joe Lamberti, owner of Rye Brook Service Center, who sponsored the contest. Let the Food Trucks Roll!